Voyeurism, as it turns out, is one of the leading topplers of totalitarianism. At least that’s what Florian Henckel von Donnersmark suggests in his Oscar-winning foreign drama The Lives of Others. The film tackles both of the aforementioned “-isms” with a formal technique that is amazing from a first-time director. Suspense fills almost every bleakly muted frame, generated not by constant cutting but by focusing on actor’s facial expressions and the many twists of the story. Gerd Wiesler (Ulrich Mühe), an interrogator in East Berlin circa 1984 (yes, like the book) is tasked with listening in on the lives of a playwright (Sebastian Koch) and his actress muse (Martina Gedeck.) At first, we see him interrogate an earlier subject with relish, and the film cuts to him as an instructor lecturing eager students with a recorded copy of the same interrogation. He seems to enjoy his work, picking at the tiniest flaws and knowing the most intimate secrets of people’s lives. However entertaining this is to watch at first, the movies demand that his character go somewhere. Von Donnersmarck takes Wiesler’s interest in this couple not to the predictable realm of obsession, though it must be somewhat present, but to sympathy for them. In a way, he becomes their creepy guardian angel, which is a source of tragedy when he can’t fully protect them. The lack of constant cutting should not lead you to think that this is a film without suspense. Quite on the contrary, as it is one of the most nail-biting experiences you’re likely to have. The story doesn’t really allow for stalking subjects in the dark or frantic games of cat-and-mouse. Instead, von Donnersmarck builds suspense through the use of his actors and the story’s many twists. Since Wiesler is going through a kind of metamorphosis and his character is largely internalized, it’s hard to predict what he will do. This methodical method of storytelling seems the work of a much more mature filmmaker, yet this is von Donnersmarck’s first full-length feature. We’d see him slip up in his second, The Tourist, but the deliberate pacing he uses in both films works much, much better here. It allows the viewer to step back and really examine the situation. We are invited to spy on these people too, as the playwright slowly descends into rebellion and the actress takes medication. However, we are also invited to spy on the spy, who is by far the most interesting character. Ulrich Mühe gives a fine performance as Wiesler, letting his eyes and subtle twitches in his face speak volumes about feelings that his line of work doesn’t allow him to express. Koch and Gedeck also give two fine sympathetic performances that give real gravity to the decisions he has to make. Even in the end, when the collapse of the Berlin Wall and other plot points have Wiesler working somewhere else, you get the feeling that he just doesn’t know how to operate in this world. He prefers to listen, and care about people from afar. A very modern sentiment to be found in a film that on the surface would only appear to be yet another critique of the Cold War. This is a German film, though, not one made from the often-skewed American perspective. 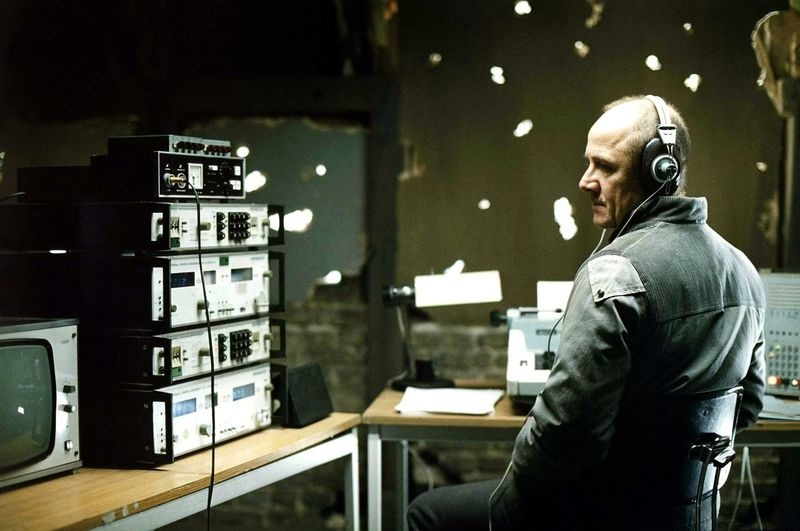 The Lives of Others is better than most of the American releases nominated for Best Picture in any given year, ghettoized in the Best Foreign Film genre like so many others. Thanks to the totalitarian structure of the Academy, it is a sure bet that an American film will always win Best Picture. This entry was posted in Reviews and tagged 1984, Berlin Wall, Best foreign films, Best suspense movies, Cold War, Communism, Florian Henckel von Donnersmarck, German movies, Oscar winner, Socialism, The Cold War, The Lives of Others, Totalitarianism by matterspamer. Bookmark the permalink. I loved the fact that this film mixed emotional power with thrilling exhilaration so seamlessly. In John le Carre’s The Spy Who Came in From the Cold, the Stasi man targeted for destruction is a dedicated true believer, while the man being kept in place by MI6 is a corrupt, time-serving career man. Similarly here, the wily, unprincipled Grubitz is manipulating the honest communist Wiesler, who really does believe what everyone in the Stasi professes, that ‘we are the party’s sword and shield’. But like Winston Smith in Nineteen Eighty-Four, the lonely, essentially decent Wiesler comes to doubt what he is doing and to suspect the patriotism of those around him. Listening in on the playwright and his girlfriend, he develops human sympathies for people his superior believes to be suffering from a sickness known as ‘anthropocentrism’. He reads Brecht. A little boy he meets on the lift insults the Stasi, but he doesn’t inquire, as he should, about the child’s father. He begins to make minor interventions, protecting the couple’s privacy; then acts in a serious, protective manner that puts his own life and career in danger. The Lives of Others subtly evokes a vindictive society that exists by turning citizens against each other in the interests of national unity and collective security. It serves as a major warning to ourselves and our elected leaders about where overzealousness and a lack of respect for individuals and their liberties can lead.